He left Ireland on March 20. Police in the USA are searching for a young Irishman who went missing while on a five month hike along the Pacific Crest Trail. 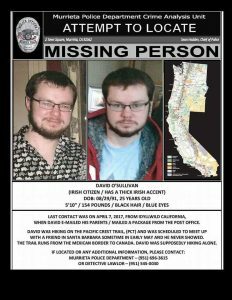 Cork native David O'Sullivan has not been in touch with his family and friends since April 7, according to a notice issued by the Murietta Police Department in California. A Facebook page set up by family and friends to gather information says that David initially left Ireland on March 20 to hike the lengthy route. The Pacific Coast Trail runs from Campo in San Diego County, near the Mexican border, across California, Oregon and Washington State to the Canadian border. The young hiker was last in touch with his family on April 7, when he sent an email to his parents posted a package from a post office in Idyllwild - but he has not been in contact since. He had been due to meet a friend in Santa Barbara in early May but never showed up. David is described as being around 5'10" with blue eyes, brown hair and wearing glasses. Cops say that the 25 year old was supposedly hiking alone along the route, which runs from the Mexican border to Canada. The Department of Foreign Affairs has confirmed it is aware of the case and is providing consular assistance. 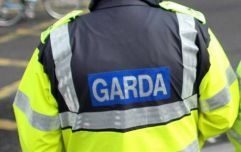 Her.ie has contacted the family and they have declined to comment at this time.